Carapico is a professor of political science and international studies at the University of Richmond in Virginia who follows Saudi Arabia closely. Her pieces include “A Call to Resist Saudi (and U.S.) Aggression in Yemen,” for The Nation, and “Romancing the Throne,” for MERIP in 2014, about Obama’s prior trip to Saudi Arabia. Ahmed is director of the Institute for Gulf Affairs and recently wrote the piece “Saudi Arabia Is a Burden, Not a Friend to the U.S.,” for the New York Times. The New York Times just published his piece “Obama Shouldn’t Trade Cluster Bombs for Saudi Arabia’s Friendship,” which states: “He should avoid doing what he did at Camp David last May, the last time he met with [the Gulf Cooperation Council]: promise more arms sales. 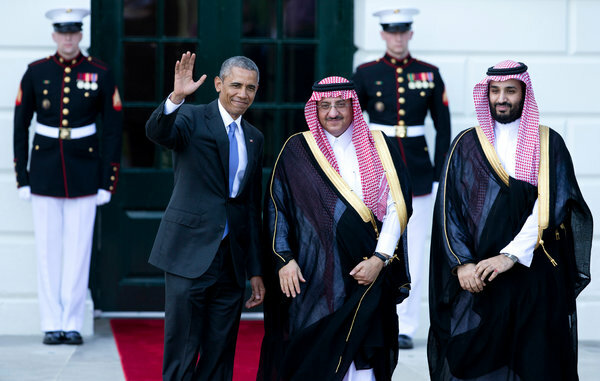 Since Mr. Obama hosted that meeting, the United States has offered over $33 billion in weaponry to its Persian Gulf allies, with the bulk of it going to Saudi Arabia. The results have been deadly.